The Japanese higher education system is a very powerful tool for their national politics and culture. The Academic accomplishments of the students studying in Japan are higher and befitted the international criteria and standards. The general policy, management and administration are under the authority of the Ministry of Education. The Japanese Government has the authority to sanction the formation of all new higher education institutions, both private and public. The finances of Universities, Junior Colleges, Specialised Colleges, Graduate Schools and College of Technology come under the jurisdiction of the Ministry of Education or Monbusho. It also lays down the minimum standards for universities with regard to curriculum, facilities, qualification and number of teachers. Many institutions can exercise autonomy in many issues, but the Ministry of Education (Monbusho) keeps hold of the main influence over the growth and development of higher education in Japan. The higher education in Japan begins after the completion of 12 years of education comprising, 6 years of elementary education and 6 years of secondary education (lower and upper secondary schooling). The students graduating from High school are eligible to go for higher education in Japan. Around 45% students from high school opt for higher education. Japan’s educational system is in a top position in terms of quality and performance. The average student scored 540 in reading literacy, maths and science in the OECD’s Programme for International Student Assessment (PISA), which is higher than the OECD average of 497, making Japan one of the top OECD country in students’ ability and skills. Approximately 70% of students who graduate from high school go for higher education studies, thereby making Japan one of the most educated nation in the globe. In Universities, social sciences such as economics or politics happen to be the foremost choices of students, followed by engineering and humanities fields of study. 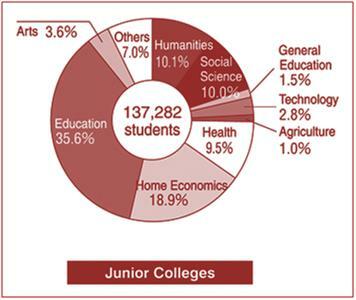 In Junior Colleges, Education, home economics and social sciences are the top three fields of study. In Professional training colleges, the health care field has the maximum population, followed by culture/general educations and engineering fields. In Japan, there are five types of higher education institutions. These higher educational institutions are classified as- national, local, public and private. Universities (Undergraduate): There are national, public and private universities in Japan. The duration of studies in an undergraduate university is 4 years with the exception of medical specialty, dental medicine, pharmacy, and veterinary science department, which needs six years of study. Junior Colleges: The duration of studies at a Junior College is two years or three years depending on the department. The Junior Colleges mainly focus on the following departments- home economics, education, nursing, humanities and sociology. Specialised/Professional Training Colleges: Specialised training colleges provide vocational and technology-related education as well as education in the enhancement of skills and knowledge required in life. These colleges mainly provide specialized training in a particular industry or career. The duration of studies is 1 year or more, but most courses lasts for two years. Colleges of Technology: Colleges of technology provide courses in engineering field, merchant shipping and other related areas of study, which lasts for 5 years (five and half for the mercantile marine course). Students who have passed junior high school are eligible for courses/programs offered by Colleges of Technology. Graduate Schools: The duration of studies in graduate schools in Japan depends on whether you are enrolled in a master's or a doctoral course of study. A Master's program lasts for two years and the doctoral course of study lasts for five years. The qualifications for admissions in higher education in Japan differ according to the type of higher educational institution you wish to apply to. For admissions to the Japanese Higher Education Institutions- Universities, Junior Colleges, Specialized Training Colleges and Colleges of Technology, you must hold an upper secondary school certificate. 12 years of school education (elementary and secondary education) completion is mandatory for entry into Japanese institutions. Students without 12 Years of Education are eligible to apply to higher education institutions in Japan, but subject to a precondition- They must have passed the entrance examination- the national examination of the relevant country (like Baccalaureate in France, Abitur in Germany, etc. ), that confirms that the students have the achievements equal or higher than those who have completed 12 years of school education. Click here to know about the Admission Requirements in detail. Associate Degree: The Associate degree is awarded upon successful completion of junior college and colleges of technology. Colleges of technology: A Student must complete at least 5 years of study and receive at least 167 credits. Technical Associate Degree: Students who have completed the post secondary courses of special training colleges, accredited by the Minister of Education, Culture, Sports, Science and Technology are awarded ‘Technical Associate Degree’. Bachelor Degree: A bachelor's degree is awarded to pupils who have finished their undergraduate studies. A student must complete 4 years of study at a University (and 6 years in the cases of medicine, dental medicine and veterinary science) and obtain at least 124 credits. Master Degree: Students who have finished their postgraduate studies in a master’s programme/course are awarded a ‘Master's degree’. A student must complete at least two years with a Graduate School and obtain 30 credits in their specialty area of study. Doctorate Degree: Students who have finished their postgraduate studies in a doctor’s programme/course are awarded a ‘Doctorate degree’. A student must complete at least five years with a Graduate School and obtain 30 credits in their field of study. The Japanese education system puts major importance on the standardized test as qualifiers for all levels of education. National Centre Test for University Admission- For admission to the higher education institutions in Japan, students are required to take the ‘National Centre Test for University Admissions’. Studying at higher education institutions in Japan calls for a sound knowledge of the Japanese language. Examination for Japanese University Admission (EJU): It is a standardised test that tests the Japanese language proficiency of non-native speakers, and required for admission to an undergraduate or graduate level course in Japan. Japanese-Language Proficiency Test (JLPT): It is a standardised test that confirms the Japanese language proficiency of non-Japanese students. Nevertheless, there are certain higher education institutions in Japan that commences its academic session in September or October, referred as an autumn-term.